I heard you guys love playing in Chicago. Not that I'm complaining about that. What's your favorite aspect of the city, whether it's playing or other parts of it? Adam Roth, lead singer: It's always had a very welcoming atmosphere to us and it's always been really good to us. Every show we've played there has been amazing. We did the Aragon, we've done some smaller shows...we did a headline show at Schubas and it sold out, that was really surprising. It's kinda become our home away from home. Well, it'll be a really cool experience to play the halftime of the Bears game, how did you guys get that setup? Adam: It was through our friend Nathan at our label, actually. Are you guys big football fans? I know Sebastian and Fredrik, you're from Sweden, and I would imagine American football isn't too big there. Bill Delia, drummer: Yeah, we're all football fans; we all are in a fantasy football league this year together, actually. So we've been having a lot of fun watching the games and keeping track of the NFL. Bill: Right now, Fredrik is in first place. Who's been your workhorse, Fredrik? Fredrik Eriksson, guitarist: Probably, I'm gonna say Gronk. He's a good guy, tight end. I actually have--I'm excited to watch the game because I have the Vikings on the defense. So they're gonna play the Bears...I'm gonna obviously go for the Bears, but it's gonna be fun to watch. It'll be my first game, I've never seen an NFL game before, so I'm pretty excited. The fact that you guys are playing a halftime show at a regular season game--I don't think I've ever seen that happen. Bill: Yeah man, we're pretty excited. There's gonna be a lot of people and I think the weather's supposed to be pretty good, too. So I guess let's start talking about your music, since this is a music blog. When you guys perform live, as compared to your studio recordings, you really rock out. Your Americana-y rock roots show a lot more than the hip-hop influence in production that's on the recordings. Is that a conscious decision? Sebastian Fritze, keyboardist and producer: I mean, I think it comes natural when we're onstage. We like to bring a certain amount of energy and it's hard to hold back when you're onstage and you have the crowd there. So we just like to rock out a lot more. In the studio, when you're writing music, there's a certain vibe, and it's a different creative process when you're in the studio and you're writing music. We like that there's a different life to a song if you can break it down to one acoustic guitar and just have it really vibey and very small and minimalistic, and then when you're in the arena you kinda wanna turn up the volume and rock out. Which of your songs would you say changes the most between the studio recording and the live version? Seb: Probably "Hymnals" is a good example of how the transformation of studio recordings to live goes. It's definitely more rock live. You guys put out the From the Road Live EP last year, and I would imagine that that was really to showcase the way that your sound is completely different in each environment. What has reaction been like to that EP? Seb: It's been great. I think it was a fun thing to do, to have the From the Spark EP be more studio sounding and then From the Road...I think it was a fun way to put out the music in a different way. It is different, and like I said, for me I like bands that sound different from the records. You don't get the same experience that you do when you're at home listening--I think a concert should be a separate experience. It's almost like a disservice to the fans if it wasn't a separate experience, because they're made in two completely different creative spaces. You brought up the creative process for writing the songs in the studio...what does your creative process look like when you're composing songs? Seb: Well, we've had the privilege of performing really early on, so it's been a mix of writing the songs on the road and playing them live and trying them out on certain crowds, so we've implemented that into the recording process for sure. It's a mix of thinking really big--and I think we always dream of playing big arenas, and that's how we kind of produce the sound of the songs. We try to envision us playing live in big arenas, stadiums. I think it definitely helps us envision it where we can try out songs live before they're even recorded. Speaking of your live show, when I saw you guys in Nashville in April you covered "Money Trees" by Kendrick Lamar and "Suffragette City" by David Bowie, two widely disparate covers. What's been your favorite cover to play, and what cover would you play that you haven't played yet? Seb: I think we really enjoy playing Kendrick because it's so different from the original and the lyrics--as soon as Adam starts singing, people are like "Oh, I know this song." I think it's a fun way to pay tribute to a song--you keep some of it, and you make it your own. So I think we really enjoy doing that one and I think the crowd likes that one too. A new cover that we wanna do...I don't know, we talk about it a lot. Adam: Maybe we'll do "Hotline Bling" next. Only if you dance like Drake. Adam: I know, I just really wanna do that dance. That's the only real reason. What's your favorite meme that you've seen out of that video? Adam: The tennis ball one's pretty good, where he's got the racket and he's doing the Nintendo Wii shuffle. You guys come from such different musical backgrounds, and that comes through in the songs you've covered. 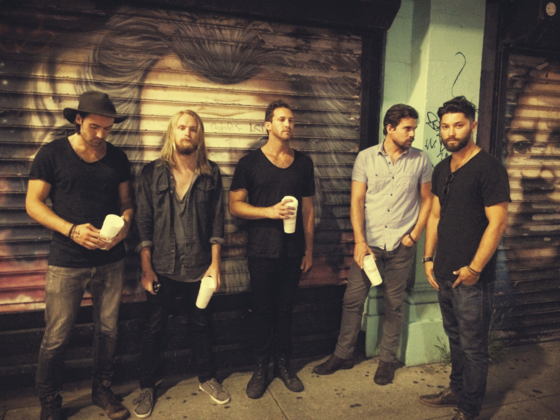 How do your different backgrounds manifest themselves in your music and was there any struggle initially in put them together to create the Grizfolk sound? Seb: I think it came naturally. We started off with just sending ideas to each other and putting your own touch into whatever's sent to you and then it just happened to come out pretty good. And we get into the studio, everyone naturally--we're all songwriters in the group, we're all producers, so we just respect each other and we all have this same mindset. I think everyone in the group knows when it's a good hook or a good song. We always try to write a song that we can always break down to a capella and it actually holds by itself without any instrumentation, so that's a good sign if the song actually comes through that way, it's worth pursuing. You guys have been touring a lot, opening for a lot of different bands--Bastille last year, Smallpools at one point, you're gonna be with X Ambassadors in November and then coming back here in December with Twenty One Pilots. What's the most important lesson you've learned from the bands you've toured with, and who taught it to you? Brandon James, bassist: I'd say that the most important lesson that we've gotten so far is probably from Bastille. We had been playing through tours before that, but then they took us out and the shows were so many times bigger than anything we had played. And so we got to watch how they did these huge shows, how they put on their show and how hard they work every day to make those shows so exciting and fun for their fans. That was really cool for us, it gave us this huge boost of energy just for our live show. We went out and we were just kind of performing out of our minds there for a while, which is really cool, man, to have that feeling, the energy of kids showing up early and waiting in line. And for us to experience that, which is something that we want, was really important. It drove us along for a long time and once we got back and finished the record, now we're about to go start doing our own headlining stuff and getting our music out there in a big way. That stuff was really invaluable. And you've already started getting out your new music: you dropped "Troublemaker," the first single off your coming LP, in July. When I heard it, it seemed like it had a lot more attitude and edge than the stuff off From the Spark. Where did that attitude come from, and how has your mental and creative state changed between the recording of From the Spark and the recording of this record? Adam: I think that we spent a lot of time on the road between when we made From the Spark, and then after that we were just writing stuff when we were on the road, and we thought we finished the record but we decided at the last minute that maybe we should try to write one or two more. And "Troublemaker" kinda came out when we were like, let's put aside everything that we've done and write something brand new. And it was a good way to close the record, as far as the writing process goes. I think it just came from being on the road and having a lot of things on our minds and stuff. What's been the most memorable moment you've had on the road over the past year? Adam: Honestly, it was doing Letterman. It was one of those things that we always wanted to do, and when we found out he was retiring we were a little bummed out but then we found out we were gonna be one of the last bands on the show. It was something that'll always be with us, even though we can't believe we were actually able to do it. We're really thankful for the opportunity because it happened so fast, it sort of feels like a dream but we have the video to prove that it happened. 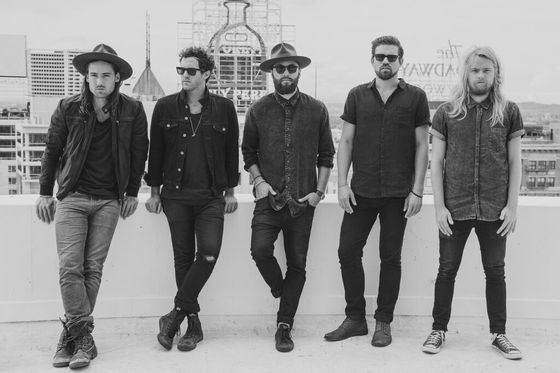 I'm really hoping the video of Grizfolk's halftime performance will be made available online after the fact. If you'd like to see the band and not have to suffer through Chicago Bears football to do it, they'll be back in town at the Aragon on Dec. 3, opening for Twenty One Pilots. Tickets are available on the resale market.